This is definitely not one of my best photos and may not have put it in here at all, except for that airplane to fly into my viewfinder. At first I thought it was a bird, but then realized it was an airplane and hit the shutter pretty fast. So special thanks to the pilot for completing my shot.. I disagree! I think this shot is awesome, the subject is so unique! The colors in the moon are beautiful, too. Thanks very much. A little luck too. Although I have been shooting the same moon from similar spot for couple of months. 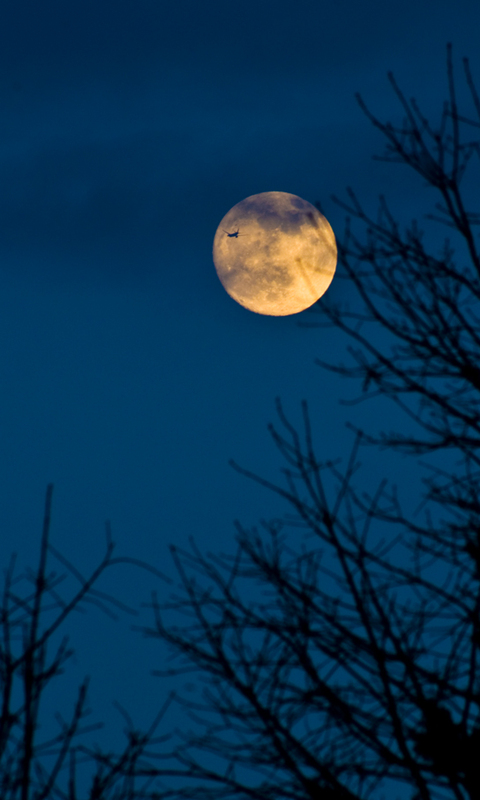 Fly me to the moon….. can hear Michael Buble singing…. Awesome shot! Thanks. Some crazy luck in there too. Love the jet. it’s like a little hidden treat in an otherwise already nice image. Wow. This is awesome! I’d love to be able to take photos like this someday. we would like to thank you for your interest in our straw bale hotel. Wow – that’s cool you got the airplane in your shot just in time! The deep blue sky, the bright moon, the dark branches – what a wonderful composition, topped with a plane on schedule, just for you! Beautiful! Very romantic too..
Love it! And love your 365 project. That’s a really stunning shot. Maybe just luck, yes, but still … what a great capture! The elusive moon!! Beautiful Shot!! That’s breathtaking; I’m in awe. You’re an incredible photographer. Wow, thanks Lexie. Much appreciated. Nice shot. At first I thought that was a witch flying past the moon! Sometimes things just happen and it’s always good when the finger can get to the shutter button! I love the height of this shot- I wish we had BIG moons over here! It’s also very like a Maurice Sendak illustration! I just shake my head! Amazing and wonderful!!! a totally different take to the witch on a broomstick flying across the moon :o) i love this shot. thanks. i got a good laugh out of this ~ thanks for posting and sharing! Are you sure you weren’t standing there waiting for a plane to fly by? woooow amazing moment for a picture, do you have the flight schedules and routs ??? Fantastic shot. Really love it. Well done. Gorgeous! I followed your “follow” here and am so excited to see such neat work! I love it when something unexpected turns a mediocre shot into something awesome! Many thanks for liking my photo blog enough to follow it. Some of my best shots have been pure luck. Just love this one! Thank you for reading liking my most recent blog post. Your picture of the moon is very nice and different. I also like your commentary about the picture. If you had not mentioned it, I may not have noticed the plane right off. Peace and Blessings. I look at this powerful image…and can only be grateful that you smiled upon my highschool graduation photo…lol. Thank you. I had to come back to see this.